If you have questions about a particular end times deceptions study, please read the related studies, as they might answer your question. Mercy, peace, and love be multiplied to you in Yahusha/Jesus name! I read all the above…SO…what is to happen in the future…if anything…to the people of planet earth? What is the context of your question? After which events take place, are you wondering what happens to the people of planet earth? Why are you so offended by the idea of flat earth? It in NO way is taking people away from God. In most cases its bringing them closer. Don’t you want that?? The idea of a globe earth actually guides more people away from God than flat earth. Both are just Ideas. But there are a lot of so called scientific principles that have been disproved over the centurys why would you think that the Globe earth idea is the exception?? Is it just because it hurts soo much to shake your belief? Thats all it is is a belief. You have to go on faith and if it disrupts that its real upsetting. Some how you must be equating your faith in God with Faith in modern mans science. That is actually an end time deception. The masses go down a wide path of destruction. Thats most of the humans. Most believe in a modern man science of globe spinning 1000 mph. There are a lot of weird websites out there and yours is no exception just because you talk about christian stuff doesnt make it seem credible to all the christians out there. It’s amazing that you bring up heliocentric concepts to me, when I clearly proclaim on my website that I believe that the earth is geocentric. I’m not ‘offended’ by the flat earth. I just want the truth, and I’ve done a lot of study on the topic. I believe that the globe earth is geocentric, which also proves a Designer; which brings people closer to their Creator. And the concept of a geocentric globe earth is much more plausible to the masses, than it being flat and in a dome. Sadly, people like you are indirectly covering over the truth. The enemy created the heliocentric model to draw people away from the Creator. Then when scientific proof that the earth is geocentric started being published in 2013, the flat earth theory was pushed on YouTube and Facebook, to cause people to ignore the geocentric globe earth model. My geocentric globe earth belief is not the wide path, it’s the hidden path; because the enemy has created a false dichotomy between the heliocentric globe earth and the flat earth. Can you clarify Mariam was virgin or she had other children except Jesus according to Psalms 69:8. Regarding the roman catholic system, can you do a study on or direct me to a study on the secret societies that sprung up as a result of the various pagan associations within the church? I.e., the Jesuits, Templars, Rosacrucians, illuminati, freemasons etc? And regarding the Jesuits, what of their order of solomon, which has pontifical backing? It is obviously gnostic, and heretical, but I am connecting all of the dots, which you have very well laid out, and the only thing I seem to have trouble putting together is how the secret societies disseminated from early christianity and on. But I don’t have one yet on how they work through many front organizations, to hide their control. 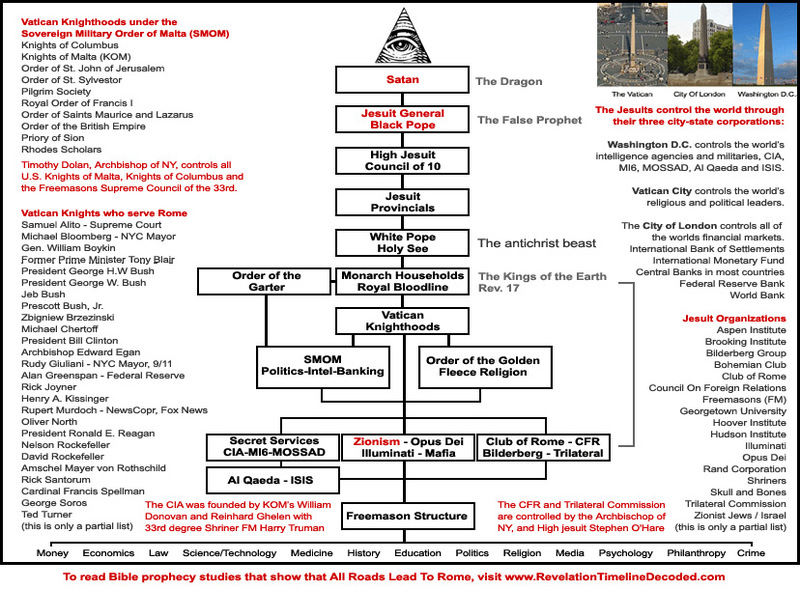 Basically, after many countries kicked them out in the 18th century, including primarily Catholic ones like France; and after the Pope suppressed them, removing their authority; they had Adam Weishaupt form the Bavarian Illuminati Jesuit Order, which then infiltrated Freemasonry, which has expanded out into many groups of power. I hope that helps! Keep learning and growing in The Way!